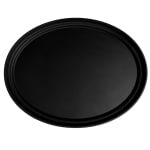 The Cambro 2500CT110 Camtread® serving tray is made of durable fiberglass that withstands high-volume use. A non-skid surface is molded into the fiberglass to prevent glasses from slipping and sliding. The material is black satin.